The Russian Defense Ministry is preparing to unveil the newest examples of military equipment for every branch of the forces this summer at the Army-2015 expo. It’s set to become the largest event of its kind ever. With about 5,000 exhibits displayed at an area of 5,500 hectares (almost 13,600 acres), Army-2015 will provide an outlet for some 3,000 contractors to show their latest products to the public. It will cover every branch of the military, from ground forces to aerospace, and even combat robots and cyber-warfare. 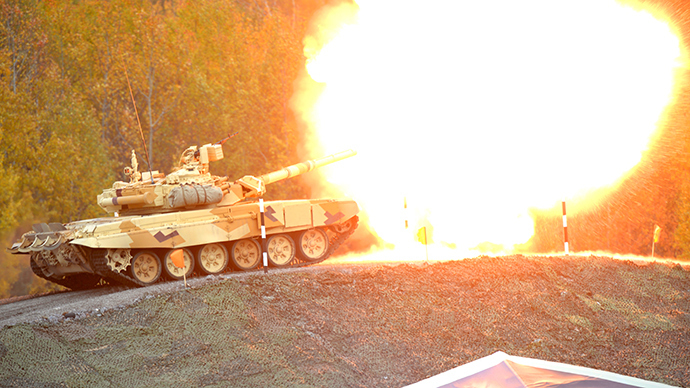 On the ground, the ministry promises to roll out a wide array of battle armor, including main battle tanks of the latest T-90 designs, armored personnel carriers, infantry combat vehicles, armored cars, mobile missile launchers, artillery, and anti-air ordnance. Tank crews will show off their skills in a 'tank ballet' performance before moving on to firing demonstrations. A military technology forum, held as part of the exhibition, will help equipment manufacturers achieve a better understanding of the army's needs, the Russian ground forces Commander-In-Chief Colonel General Oleg Salyukov said. The Russian Navy will also display its latest accoutrements, including ship-based aircraft, amphibious armored vehicles and coastal defense missile and radar complexes. Smaller examples of water-based equipment, including unmanned mini-submarines, will be displayed in an artificial body of water, created for that specific purpose. The exhibition will be taking place at a time of change for Russia's Air Force and Aerospace Defense Force, as the two branches are about to be united into a single Aerospace Force. The newly-merged branches will boast new anti-missile and air systems, as well as different-purposed space vessels. A spectacular airshow with some of Russia's best pilots is also in store for the visitors, including simulated dogfights and aerobatics. The Russian Defense Ministry sees the creation of robots and drones as one of the most important branches of military development. As such, a wide array of unmanned vehicles and machines will be displayed at the exhibition, suitable for all possible environments and usable for both military and civilian purposes, from minesweeping to search and rescue. A separate section will be dedicated to "non-traditional" weapons, some of which sound like the stuff of science fiction. These include laser, particle-beam, orbital kinetic and microwave weaponry, as well as non-lethal armaments and information warfare equipment. Aside from striking deals to update the Russian army's hardware and showing off the latest military tech, Army-2015 aims to improve the armed forces' image and popularity. "Army-2015 will not only display the latest Russian weapons and hardware, but will serve as a demonstration of the personnel's high morale, improved combat skills and culture in the army and fleet," says HR chief, Major General Mikhail Smyslov. To that end, the expo will host the first stages of the "Commonwealth warrior" competition, which will include contest of combat skill as well as knowledge of military history. The exhibition's huge area will be capable of hosting about 100,000 visitors every day. Apart from military contractor meetings and deal-making, the organizers promise plenty to see and take part in. The program will include paintball shoot-outs, a motocross show and reconstructions of historic battles, as well as military band performances and even an exhibition of military-themed art.